'One in a series' of archive articles. click here to read John Hastie describing an outing way back in 1987. Do you recognise anyone? Wonder where they are now. 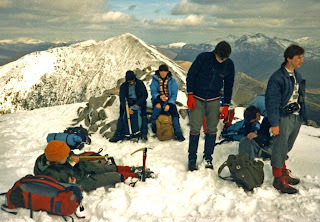 I`m sure I`ve got some old prints in the attic from the trips I made with the Moray Club in the mid 80`s. Definitely got one of John Mykura and Irene Cook on the summit of Ladhar Bheinn somewhere on my pc. Be delighted if you could send me *ANY* pictures of trips/dinners with the Moray Club. Hope you enjoy our (current & journal) blogs, great difficulty is finding sufficient time to keep posting regularly, probably running about a year behind in 'current' blogging, never mind all the journals! I'll post a link to 'Bluesky' on the Moray Club site, you have a great blog there. Mine are all slides so it may take a bit of time but I shall endeavour to do some over the holiday period.Bob McFarlane I know has an attic full of old pics so will ask him to help out also. I wasn`t out very much with the Moray but the trips I did make were memorable due to the easy going nature of you lot :) Bob and I were reminiscing the other week and I had completely forgotten about your starring role on tv with Angela Rippon . If you see David Lockhart you can tell him he can keep my Arrochar climbing guide..! PS: Never thought of putting a link on our blog to the Moray Club but will do so asap. you've reminded be of the wonderful BBC hospitality....and I can hardly believe it was some 24 years ago! Must post a clip from the show, if only to show me with hair! I remember Bob quite well, very tall, slim and fit. I know it's a pain digging out slides to scan but it would be appreciated! though I suspect he has now consigned his climbing gear to the back of the cupboard. Did you guys meet through the Bad Boy's?